Set it in stone! 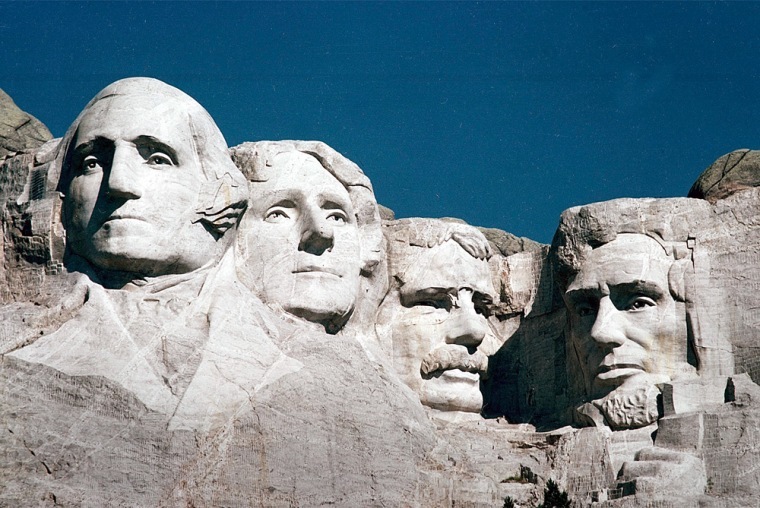 South Dakota, the home of Mount Rushmore, where the greatest presidents are carved into rock, is this year's top state for doing business in America, according to CNBC. It finished ahead of Texas, last year's winner, and neighboring North Dakota, which came third in the annual poll. Nebraska finished fourth and there was a tie for fifth between Utah and Virginia. South Dakota's point total this year—1,639 out of a possible 2,500—is the highest logged by any state since CNBC began keeping score in 2007. Each year, NBC's business channel rates all 50 states on more than 50 metrics in 10 categories of competitiveness. It weighs the categories based on how frequently they appear as selling points in state economic development marketing materials. That way, states are held to their own standards. And the state's economy, while often overshadowed by its oil-booming neighbor to the north, finishes a solid sixth. State finances are strong, the housing market is recovering, and the unemployment rate is among the nation's lowest. Texas, which has never finished below second place in our study, keeps the streak alive in 2013. Texas makes a big deal about low costs, and with no individual or corporate income tax, the Lone Star State does offer one of the most favorable tax burdens in the country, despite higher-than-average sales and property taxes. But Cost of Doing Business measures more than just taxes. For example, Texas has some of the highest electricity costs in the country, and office and retail rent is on the high side as well. North Dakota, a historic economic success story, improves on last year's fifth place finish to come in third this year. But North Dakota is, in some ways, held back by its own prosperity. With the nation's lowest unemployment rate, workers are in short supply. That raises wage costs. And North Dakota's growing pains leave the state with some of the most expensive rental costs in the country for industrial space. Nebraska cracks our Top Five for the first time, shining in Business Friendliness, where it finishes third, as well as Economy and Quality of Life, where it comes in fourth. Tax reform has been a major priority in the state, which comes in 10th for Cost of Doing Business. We have never had a tie in our Top Five, until now. Utah and Virginia, last year's Nos. 2 and 3 states respectively, tie for fifth place this year. Massachusetts, which climbs to 16th place from 28th a year ago, improves in most categories this year, most notably Economy, where the state jumps to third place from 21st. The state is experiencing solid economic growth, state finances are improving, and so is the housing market. Massachusetts does drop to seventh for Education, however, a category where it is typically at or near the top. Delaware moves up to 31st from 43rd. Yes, Delaware is the corporate address for more than half the nation's publicly traded companies, and accommodative business regulations are the reason. But the First State has been embroiled in controversy over its unclaimed property laws, which some have called a "stealth tax" on business. The state has raked in millions year after year by assessing businesses penalties and fees for property they hold but no longer own. Nevada, which finishes 46th, falling from 45th last year, is still mired in the housing crisis, with the highest foreclosure rate in the nation. With the highest unemployment as well, it is no wonder Nevada finishes at the bottom of our Economy category. It also finishes at the bottom for Education, and near the bottom for Quality of Life and Access to Capital. We want to know what you think. Check out our complete rankings to see how your state stacks up. Leave us your comments on Twitter or Facebook using the tag #TopStates.